Rangers boss Steven Gerrard is looking forward to a "box-office battle" between Alfredo Morelos and Scott McKenna when the Ibrox side visit Aberdeen in the Scottish Cup quarter-finals on Sunday. Both players were sent off when Rangers won 4-2 at Pittodrie last month, with Morelos scoring two first-half goals. 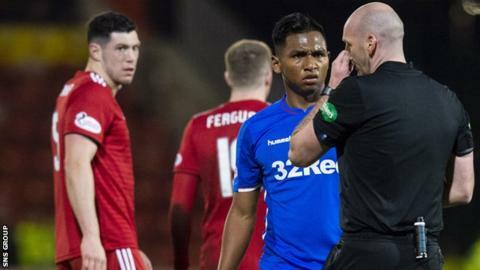 The Rangers striker has been dismissed in all three league meetings against Aberdeen this term, although the first of those decisions was later rescinded. "It will be a battle," said Gerrard. "It was a real shame last time, both of them getting sent off, I was really enjoying it. Scott is a tremendous defender and Alfredo, on the day, was unplayable. "Hopefully, both players stay on the right side of it this time and we can see that box-office battle for 90 minutes." Morelos received up a three-game ban and McKenna missed two games after the most recent tussle. But the Colombian striker has since taken his goal tally to 28 for the season with four against Kilmarnock in a cup replay and a strike against Dundee on Wednesday. "Alfredo doesn't need to prove anything to anyone but himself," said Gerrard. "He just needs to focus on the game and what we need him to do to try and get us an important win. "A lot of defenders have to be physical to try and stop him but Alfredo should see that as a compliment." Rangers are unbeaten in nine games, have not conceded in their past five outings and scored 14 goals in their last three. Aberdeen, who knocked Rangers out in the League Cup semi-finals, have struggled at home of late, going five games without a win at Pittodrie in the league. However, Gerrard "expects the best" from them. "The pleasing thing for me is that we are doing the basics well," said Gerrard, who revealed that Scott Arfield and Andy Halliday are fitness doubts. "We need to take that into the game. We can't go in full of confidence and thinking it's going to be another straightforward win. This will be a tough test in a hostile environment."